Operation Firefly Day 3 has limited spots for our members so please inform MSG A. Baum, CPL. B. Piper or SSG. D. Jordan if you will be attending and for a list of available positions. BOTH teams require AT personnel. 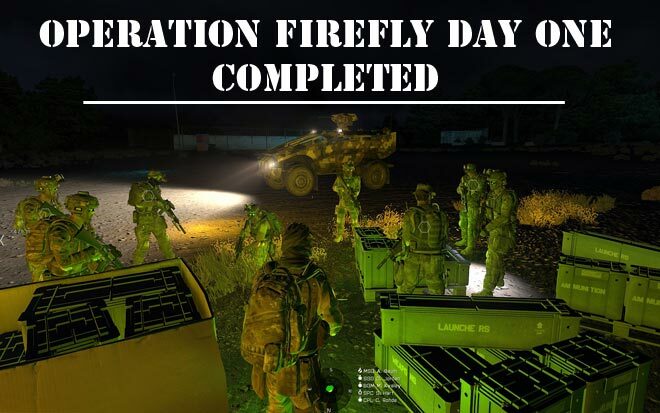 In day two of OPERATION FIREFLY, members of the 75th Ranger Regiment were tasked to hold the airfield that they had secured the night before against counterattack from CSAT forces. Day Two of Operation Firefly began by members of the 75th Ranger Regiment regrouping in the early morning hours in order to repel the counterattack on the south east airfield of Altis spearheaded by Special operations CSAT forces. Rangers immediately began taking effective mortar fire at sunrise. Team Alpha mobilized quickly and began moving North West in order to destroy the enemy mortar team firing on the airbase. Upon cresting the hill, Alpha Team leader MSG A. Baum made visual contact with the mortar team as CPL J. Smith and CPL A. Dalton flanked East. MSG Baum’s team eliminated the mortar team as CPL Smith and CPL Dalton suppressed the enemy. Upon eliminating the mortar team, Alpha team made contact with a platoon of CSAT forces cresting the hill in reaction to the gunfire. Alpha team hastily fell back to the Airbase perimeter under cover from effective fire put down by Bravo Team led by SSG D. Jordan. This reaction to gunfire by CSAT forces turned into a full-fledged counterattack by an entire company of CSAT forces. Rangers quickly set up a defensive perimeter in order to defend the airbase. CSAT forces breached the perimeter and were dispatched in a grueling close-range gunfight on the runway of the airbase. Wave after wave of CSAT forces were eliminated by members of the 75th Rangers. After a long, drawn-out defense, Rangers mounted up in order to sweep the area and mop up straggling CSAT forces around the airbase. Approaching the end of their sweep rangers encountered CSAT Armor and began taking heavy casualties. Rangers, again, immediately fell back and set up a hasty defense around a bombed-out CSAT MRAP and Antiarmor was called up to deal with the CSAT Armor. One armored vehicle was destroyed, and Rangers withdrew back into the airbase perimeter. While falling back, Rangers encountered the second armored vehicle and sustained a few more casualties while CPL Rhode got into position to destroy the MBT. Upon destruction of the armored vehicles, Rangers continued with their mop-up action, and eliminated all remaining CSAT forces. The counterattack was successfully repelled. Invasion of Altis by NATO forces is ensured. In response to the unprovoked invasion of Altis (a Greek island nation) by enemy forces, Task Force 20 has mobilized and initiated military actions to assist the legitimate government reclaim their country. During the early morning darkness members of the 75th Rangers silently came ashore by boats at the southeastern tip of the island from two different points. The teams of Rangers were initially tasked with cutting the power simultaneously at two power plants in order to disrupt enemy activities, plunging the lower part of the country into darkness. Each team encountered random patrols on their way to their targets. The action was fierce as bullets, at times, seemed to come from all directions. After destroying the power plants, NATO forces began an armored assault on the town of Selakano. Tracers filled the air and explosions ran out as friendly forces systematically broke down their adversaries will to fight. At the same time, the enemy’s response to the power plants destruction was immediate. Enemy forces poured out in a coordinated attack that included teams of soldiers delivered by ifrits and helicopters. Both Alpha and Bravo teams were able to avoid the main body of soldiers. Alpha team moved east toward a small enemy compound to kill a high ranking officer known to be at that location. The officer was dispatched from a distance, and then the team moved in to mop up the remaining soldiers. Bravo team moved west into the small, war-torn town of FERES to locate a laptop belonging to a neuroscientist that has been captured by enemy forces. It is believed that the laptop contained information regarding a potent new neuro-toxin. Bravo team located the facility, neutralized the guards and inserted a virus into the laptop by a flash drive. The team then headed west out of town. After Alpha team cleared the military compound, they continued east to recon a dirt airfield and was instructed to stand by until Bravo team was in position in order to coordinate a two-pronged attack on the airfield. A swift, violent attack on the airfield was initiated when Bravo team members made their way onto the field through a small hole in the fence amidst the moonlight. Alpha team took advantage of their high ground to take out guards at the front gate, as well as, soldiers confused by the coordinated attack. They then moved in toward the west side of the base and assisted Bravo team with securing the airfield. The 75th Rangers have secured the airfield as our FOB and suffered minimal injuries to soldiers in the first night of Operation Firefly. Ready up Soldiers! Task Force 20 has officially launched our first Campaign Series in order to bring not only engaging and challenging operations, but also an active storyline to engage members in an intense experience. These missions will be launched every Saturday night at 22:00 EST so get active and ready for combat!